When you create an online course, a great way to drive sales is with a coupon. And the great thing about coupons is they're super flexible. Coupons can last forever or be short-lived (like a "weekend special," for example), they can be a "percentage off" or a dollar discount, and can be shared with everyone or shared selectively. Normal coupons: These behave like standard coupons. Your customers can use them for whatever “$ off” or “% off” discount you choose. 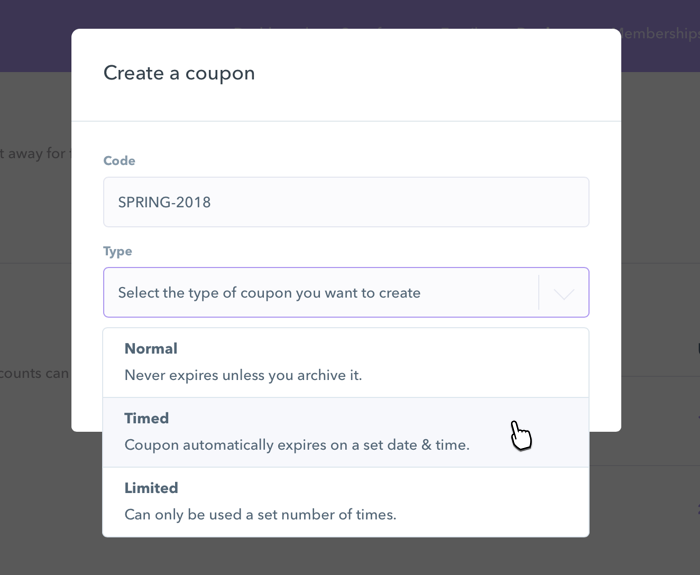 Timed coupons: These expire on a set date, and can be useful for time-limited sales (for example, a Black Friday sale). Limited-Use coupons: These can only be used a pre-defined number of times, and are best for creating scarcity (e.g. “only 10 discounted spots available!”) or generating a coupon that you only want a single customer to be able to use. Note on coupon times: All coupon expirations will be set to UTC. To compare your local time zone to UTC, check out this world clock. Step 1: Click on "Products" in the top bar of your navigation, then click on the "Edit" button on the far right of the product you'd like to create a coupon for. Step 3: Scroll down the page until you see the coupon section. Next, click on the "Add coupon" button and when the modal pops up, choose the type of coupon you'd like to create, and then enter the coupon information. Pro tip: try to think of a relevant and/or memorable name for your coupon (for example: "EBOOKSALE"). To share your coupon with customers, click on the three dots on the right, choose "Copy Shareable URL" and share that link in order for people to redeem the discount.